This consists of three base/factory themed levels and utilizes some nice custom textures. The first two maps are medium in size while the third map serves as an epilogue. All skill levels are included. 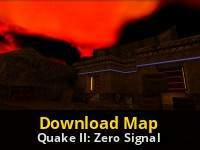 Due to the complexity of the maps in some areas, a limit removing engine such as KMQuake II is required. Not long after the war on Stroggos came to an end, military scanners picked up a powerful signal from an unrevealed location on the alien home world. The origin of this signal could not be determined precisely, so a team of marines were quickly dispatched in the vicinity to investigate. As soon as the dropships neared the landing zone, they were hit by enemy fire. Your dropship took severe damage but you managed to jump out seconds before it exploded. With your team killed in action and all of the ship's heavy weaponry scattered in the area, you took what was left of the supplies and prepared yourself for yet another battle against the unholy alliance of flesh and metal.